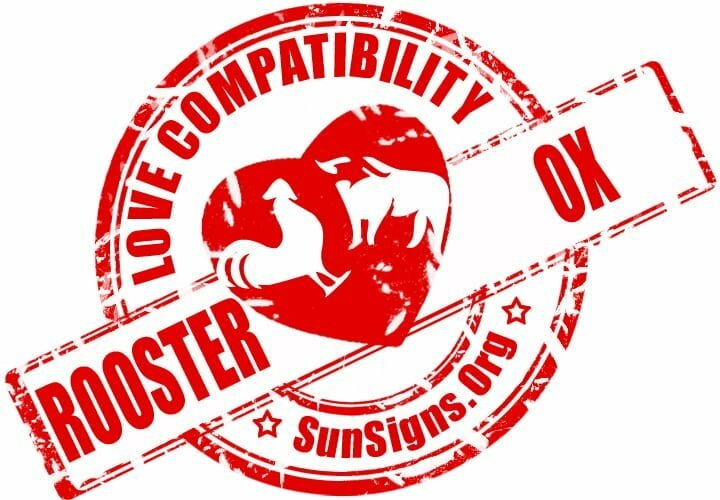 Chinese astrology predicts that the rooster and ox relationship has the potential to enjoy a very good love compatibility. Is there anything that can cause them trouble? Are they well suited enough that they fit easily together? Will the rooster-ox in love have to put in a lot of hard work to be happy together? The ox man or woman is typically shy and somber, and somewhat withdrawn. When they are in love, they become very sweet. They do not like arguing and avoid it as much as they can. They prefer to make the home a peaceful, balanced place. This is just the kind of atmosphere the rooster needs to thrive. The rooster man or woman will glorify affection and love. They will be more social than their lovers and might even be able to help pull the ox out of their shell. The two Chinese zodiac rooster and ox soul mates go very well together. Whether their relationship is friendly or romantic, these two have an easy time. Both have a similar demeanor. They also share similar beliefs and any differences they have tend to complement each other rather than force them apart. In the rooster and ox marriage, both will tend to be more traditional. Both would rather use rational, proven methods to anything daring. Roosters have a need for perfectionism and this works well with the ox’s capability of wanting to do things right the first time around. These attributes tend to be especially successful when applied to work or career or in a business relationship in general. The rooster and ox friendship usually makes a very good rational and strong team. The steady oxen are able to be the backbone of the business. The rooster’s smart eye and resourcefulness can help push things along toward success. The two Chinese astrology signs in a romantic relationship work just as well as in a business relationship. Both will highly regard the ability to trust each other. They both find honesty extremely important. The rooster and ox in love both are unlikely to give each other a reason to be clingy or envious. The male or female ox has a sense of honor and will be more than capable of living up to the male or female rooster’s high expectations. They appreciate each others’ aware and diligent natures. The rooster-ox compatibility is absolutely excellent. Both are systematic and meticulous. Both of them will enjoy things that simulate their intelligence. They are both capable and tend to be detail oriented. They are both very capable of taking criticism well. Because of this they are likely to be a satisfied couple. Even in bed, the rooster-ox couple are sexually complementary. These two Chinese zodiac signs will thrive on their similarities. They both have the same outlook and treat their long-term goals the same way. Their goals are usually more geared towards achieving something materialistic. The rooster and ox breakup will occur only in the most dire circumstances. The differences between the rooster and ox when they are dating, are what will enable them to build up a relationship in a slow, careful manner. The ox is shy, full of strength and nobility. On the other hand, the rooster is loud, outgoing, and blunt. Their own diligence and sense of responsibility will be what is attractive to the ox. The only thing these two might experience problems with is in their adoration of material things. Rooster & Ox Chinese Horoscope Compatibility Rated 5 Hearts!